Organizations are awash in data churned out daily by operational/transactional systems, imported from purchased databases and propagated through analysis and reporting. But that's only the tip of the data iceberg. By some estimates, a minimum of 70 percent of data is actually unstructured data – freeform text, images, audio and video captured from online and offline sources. 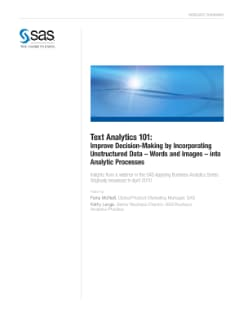 That's where text analytics comes in. But how can a machine interpret the nuances of human language and other freeform information and use it for meaningful structured analysis? That was the topic of a SAS webinar in the Applying Business Analytics series, originally broadcast in April 2010. This paper provides a summary of that webcast.